In 2005, Animal Welfare Advocate Colleen Paige named December 2 National Mutt Day to encourage animal lovers to embrace, adopt, and celebrate mixed breed dogs. The intention of the “howliday” is to promote awareness that millions of mixed-breed dogs are caged in shelters, waiting to be adopted by a loving family. To celebrate this day, you can volunteer at a shelter, spend the day playing with dogs at the park, or even take a few moments just to talk to your canine neighbors and reassure them that they’re “good dogs.” However, no matter how you plan to celebrate, it’s important that you remember to stay safe. Ask before you touch. Some dogs aren’t open to strangers touching them. Before you or your children approach a strange dog, always ask his owner if it’s OK to pet him. Approach slowly. Some dogs are easily startled, and when they’re startled they become aggressive. When you approach, make sure you get the dog’s attention well before you’re within biting range. Also, never sneak up or try to surprise a dog, especially when he is sleeping. You never know how he may react. Monitor reactions and watch for signs of aggression. Although not as finicky as felines, dogs can change moods in a heartbeat. One second they may love the attention of wrestling and rolling around, the next, they may become anxious or scared and retaliate with growls and nips. 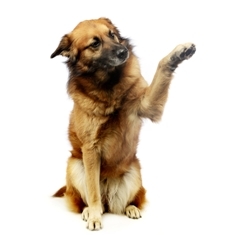 When playing with a dog, listen for low growls or yips and watch for raised hackles (hair on the back of the neck). These are all signs of potential aggression and signals that you may want to consider backing off. Promote caring and calm actions. Treat dogs as if they were infants. Don’t rough-house and discourage children from tugging on their ears, pulling their tails, or screaming in their faces. Too much excitement or physical contact can cause stress, which can lead to aggression. National Mutt Day is the perfect time to show your love for dogs of all breeds. Just remember, no matter how cute or tame they may appear, dogs are still animals and animals have aggressive instincts. Do not ignore the signs or push a pup beyond his limits. Otherwise, your day of puppy love may turn into a day of stitches, pain, and emergency room boredom. Post a Comment to "National Mutt Day Safety Tips to Avoid Nasty Dog Bites"